Founded by two British brothers Charles W. and Benjamin J. Fox, the firm was founded to manufacture wooden furniture and fireplace mantels. 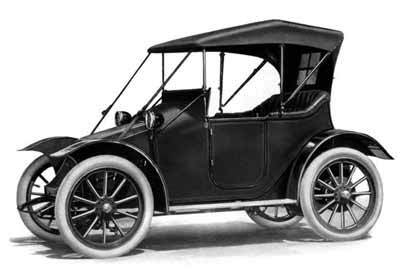 Automobile bodies were added to the mix in 1908-1909, its customers including the Ford Motor Co. and other Detroit-based automakers. The management of the firm was also involved in three other Detroit-based body builders: Kelsey, Herbert Co., Kelsey Wheel Co. and the Herbert Mfg. Co.
Charles Westfield Fox was born in England on November 26, 1860. Following his 1867 emigration to Schömberg, Ontario, Canada, he was enrolled in the public schoolhouse after which he was apprenticed to a Schömberg cabinet-maker and millwright after which he relocated to Duluth, Minnesota, where he spent four years building sawmills and grain elevators (likely for the Consolidated Elevator Co.). Fox moved to Detroit in November of 1887 where he took a job as superintendent and designer for Gray & Baffy - Messrs. Alfred A. Gray and Eugene Baffy - manufacturers of Lounges, Mattresses and Parlor Furniture at 98-102 Congress St. W.
Fox married Mary Bell Shaver but the union was short-lived as she died in childbirth, although her infant daughter survived. Shortly thereafter Charles remarried to Nina Hague (b.1878 in Mich.) and to the blessed union were born two children, Nina V. (b. 1907) and Charles Westfield Fox jr. (b. 1917). 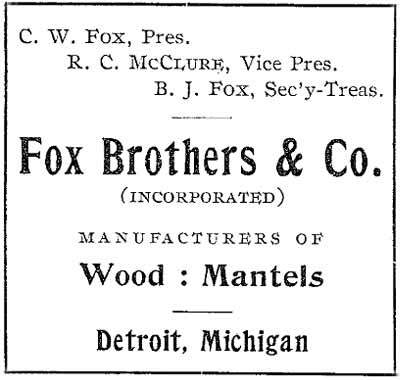 In 1892 Fox entered into a partnership with R. C. McClure and his younger brother, Benjamin, as Fox Brothers & Company, manufacturers of special furniture and wood mantels. Benjamin J. Fox was born in Schömberg, Ontario, Canada in 1869. After a career and education that mirrored his brother’s, he joined his sibling in Detroit in the late 1880s. He married Loretta M. (b. 1873 in Mich.) and to the blessed union were born 4children; Lillie P.(b. 1897); Charles W.(b. 1901); Loretta P. (b. 1905); and William E. (b. 1911) Fox. The 1898 edition of the annual Michigan Bureau of Labor and Industrial Statistics Report lists Fox Bros. & Co., Detroit, mfrs. of wood mantels, as having a staff of 30 male employees; avg. monthly payroll $1,100. The 1909 edition of the annual Michigan Bureau of Labor and Industrial Statistics Report lists Fox Bros. & Co., Detroit, mfrs. of wood mantels, as having a staff of 36 male employees, 2 female, for a total of 38. 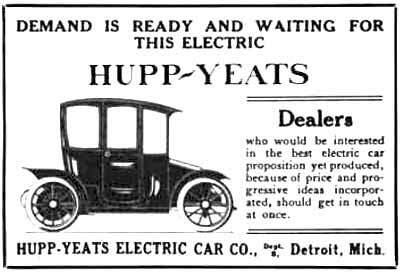 “In order to care for the steadily increasing demand for the Hupp-Yeats electric cars, it has been found necessary to provide a much larger factory, and the buildings in Detroit, formerly occupied by the Herbert Manufacturing Company, have been leased for the future home of this car. The Hupp-Yeats has been constructed in the plant of the R-C-H Corporation on Lycaste street, Detroit, the new R-C-H gasoline car also being manufactured in this plant. Although several buildings have been added during the past six months, the growing requirements of the business in connection with the two machines made a change imperative. “Establishing the Hupp-Yeats in new and larger factory quarters not only will permit of a greatly increased output of electric cars, but the space gained at the R-C-H plant will enable the R-C-H Corporation to increase its output of gasoline machines over 50 per cent. One of the important features in connection with the change, is the association of C. W. Fox with the Hupp-Yeats interests. Mr. Fox is widely known throughout the industry because of his connection with Fox Bros. & Co., occupying for a number of years a foremost position in the construction of automobile bodies. He will devote a large part of his time to the production of Hupp-Yeats electrics, although he will retain his interests with the body building business. “Detroit and New York Men Appear at Creditors' Meeting and Raise Harris Brothers' Bid—Lively Fight for Control Now Expected. “Because of the eleventh hour appearance of new bidders for the assets of the bankrupt R-C-H Corporation, of Detroit, on Monday of this week, affairs took a sudden turn, and the seemingly "cut-and-dried" sale to the Harris Brothers, of Chicago, was held up, pending further developments. When the creditors assembled before the referee in bankruptcy, Lee E. Joslyn, on Monday, the business of the day was the acceptance and confirmation of the bid of the Harris Brothers, amounting to $240,000, exclusive of $28,400 in liabilities which must be paid by the purchaser. To the surprise of the assembled creditors, however, representatives of another group appeared with a more favorable proposition, offering $255,100, exclusive of the guarantees. The solitary representative of Harris Brothers present at the meeting did not have the necessary authority to raise the bid on his own responsibility, and the meeting was adjourned for a few days, in order to give the referee and the creditors time to think matters over, as well as to give Harris Brothers an opportunity to raise their bid. “With the appearance of a new bidder in the field, the prospects for the unsigned creditors grow a little brighter, and it would not surprise those on the "inside" if the fight for control between the new bidders and Harris Brothers boosted the bid to well above $300,000. The interests so far revealed behind the new bidders are the Lincoln Real Estate Co., Frank Brothers Iron & Metal Co., and Benjamin B. Jacob, of Detroit, and C. J. O'Hara and Theodore Friedburg, of New York. “About 200 or more creditors will derive no dividends whatever from the sale, as they signed off all claims in order that the concern might be saved from a bankruptcy sale and continued as a working corporation. These creditors claims amount to $1,442,512.66. The Firestone Tire & Rubber Co. will lose $113,890, the Goodyear Tire Co., of Akron, O., $144,384, and the Herbert Manufacturing Co., of Detroit, $218,988. These were the three companies to lose the biggest sums, while creditors who had signed off lost from 50 cents up, the majority of them losing over $5,000. “Unsigned creditors' claims amount to $43,948.92. Secured claims amount to $9,518.61 and the receivers now have on hand $118,000 received from sales made since the concern has been in the hands of the receivers. Unsecured claims which include both the creditors who signed off and those who did not sign off, amount to $1,687,663.47, and the total liabilities are $1,873,813. 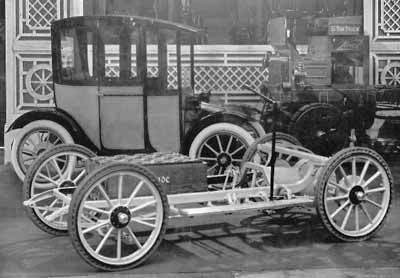 With no automobile production to manage, Charles W. Fox assumed control of the automobile body divisions of the Herbert Mfg. and Kelsey Wheel Co.’s. As early as 1892 Fox had been associated with Kelsey as a stockholder and director, and was instrumental in the acquisition of the Herbert Mfg. Co. which merged with the Kelsey Co. in 1916-1917. For a number of years they also operated a satellite branch, Fox Bros. & Co., Ltd., across the Detroit River in Windsor, Ontario, Canada. It appears that both firms bearing the Fox surname discontinued operations sometime during the First World War after which Benjamin joined Kelsey Wheel Co. where his brother Charles was now serving as vice-president and secretary-treasurer. Callahan, J. M., "Life After Buyout," Automotive Industry, August 1987 issue. "Canada's Varity Agrees to Buy K-H For Reduced Price," Wall Street Journal, October 5, 1989.